Blimey. It’s October! How did that happen? As much as I’d prefer to not have to think about the ol’ festive season until mid-December, living on a tight budget means I have to start thinking about Christmas gifts well in advance. The first one I’ve come across this year is the Superdry Beauty Bento Box*. As a beauty aficionado and a sushi fiend, I love it already. This cute recycled cardboard gift box is stuffed with both full sized and mini versions of some of the bestselling products from the Superdry Beauty range. It’s a great introduction to the brand for those who’ve not tried it before, as well as a good choice for someone who already loves the range. I’ve previously professed my love for some of the products but most of the ones in the Bento Box are ones I’ve not tried before, which is cool. Let’s start with the cursory accessories – a nail file and a mirror. Obviously both useful to have, but I would suggest that the mirror isn’t an ideal one to throw haphazardly into your bag as it doesn’t have a cover and therefore might be prone to smashing. It hasn’t happened to me, just something to be mindful of! I still hadn’t got around to trying Superdry’s Nail Paints until now, but the little hot pink mini in this set is their bestselling shade. Annoyingly I can’t tell you what it’s called because there’s no name on the bottle and I can’t find it on the website either, but I can tell you that it’s nicely opaque and easy to apply, drying at a reasonable speed and leaving a high gloss finish. Then there’s a mini of their popular Benefit High Beam style highlighter, which is really lovely – very creamy, easy to blend into the skin without disturbing any foundation underneath and imparts a super pretty glow where it’s applied. I spoke about the Lip Fix in the post linked above – I’d previously only tried Coconut, this one is Watermelon and it’s just as delicious. I love the formula of these, you only need the tiniest speck as a little goes a long way and whilst it takes a fair while to sink it, it leaves your lips feeling gorgeously moisturised. The glossy finish means it also works great over lipstick. 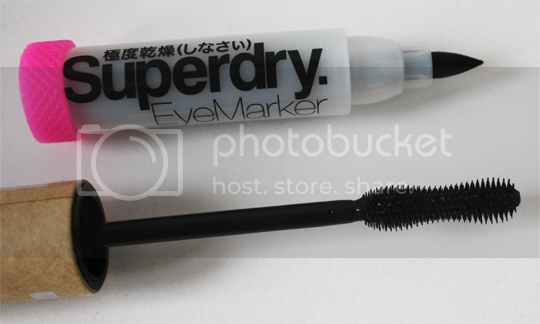 Now we come to the eye products – the Eye Marker and Mascara. The eye marker is really versatile as the very tip is super fine, but the bullet itself is fairly chunky meaning you can create a thin and delicate line or a thicker, statement eyeliner look. It’s extremely pigmented, with no skipping or dragging on the lid, and lasts all day without flaking, fading or smudging. 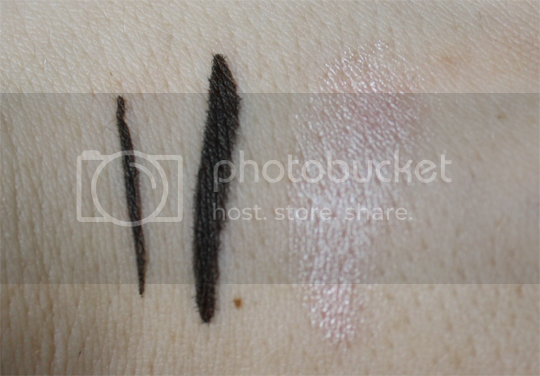 Excellent stuff – see it swatched above with thin and thick lines, along with the Highlighter. The mascara doesn’t excite me quite so much – I love the wand and how the formula applies, and whilst my lashes look fab immediately after application this just doesn’t hold a curl in my lashes. That’s not the mascara’s fault, though – I have this problem with 99.9% of mascaras in the world, I just have rubbish lashes *sigh*. This cute little gift set comes in at £25, a fab saving on the individual RRPs of everything in the set. Definitely one to keep in mind for any other beauty fans in your life, so keep an eye out for it hitting stores sometime this month (October 2013) as well as online. I LOVE the packaging of the mascara and liner pen!